Do you plan on taking pictures to track it's growth? I wonder how long it will take for it to grow to the first power line? Leslie, I'm definitely taking a picture at the end of summer. I want to see the difference! And then during the Fall. It survived last winter… all skinny and bare. Now I regret not taking a picture. I love this picture! The perspective and that tree amongst all the concrete and buildings and wires. I used to have an office with a blossom tree outside my window. I used to track it over the spring/summer. I miss that office. Ames, I love the perspective as well! 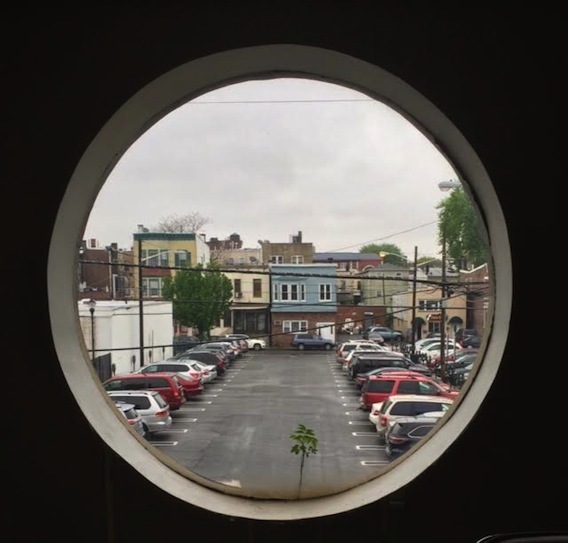 My title was going to be "Urban Portrait: Round Window with Sapling," and then I changed it. All that concrete and then that little tree growing outside that second floor window! Nature. Aww, a blossom tree! How lovely. I would miss that too! Hey Hils! Sorry for the late comment... This week has really been busy and I'm barely able to write my post on time, so blog-hopping... LOL. It does look like a tree in the middle of a parking lot. LOL. Ever seen that picture of a tree in the middle of a highway? :P They built the highway around it. Nath! It is LITERALLY growing on the side of the window/in the building! I probably should say on the window sill, on the outside of the window. LOL And, the window is on the second floor, so the perspective makes it seem like the sapling is growing on the parking lot, or something like that. I've never seen the tree in the middle of the highway. That must be a sight!